Since each hair has it own directly blood supply, the ingestion of any illegal drugs will be transport by blood and trapped by the hair, which can be revealed by analyzing a small sample of hair. Our testing method measures the drug molecules and the metabolites embedded inside the hair shaft, eliminating external contamination as a source of a positive test result. Hair testing results cannot be altered with shampoos or other external chemicals. These seven drug classes are mandated for testing by the U.S. Federal Government and specially focused on Asian region. A standard screen covers a period of at least 90 days, depending on the length of the tested hair. 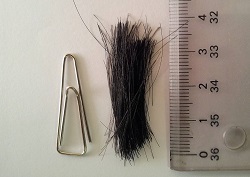 The hair sample is cut as close to the scalp as possible and the most recent 1.5 inches are tested. A standard screen with GC/MS confirmation requires at least 0.1 grams of hair or approximately 90 to 120 strands. The thickness of different types of head hair (thick coarse vs. thinning fine) is the reason for this variation. Cocaine, methamphetamine, opiates, ketamine and Benzodiazepinesare rapidly excreted in urine and undetectable in urine 72 hours after use. The detection period for hair is limited only by the length of the hair sample, i.e. the longer the hair sample, the longer the history of drug taken can be unveiled. At this time there are no known adulterants for hair tests. Since hair tests analyze the drugs inside the hair shaft, external contaminants/chemicals have no effect. What is the shortest time period that can be evaluated? The minimum time period is approximately two weeks (1/4 inch). Hair can be collected from several head locations and combined to obtain the required amount of hair. In addition, body hair may be used as a substitute to head hair. Body hair can be used if head hair is too short for a test. If body hair is used the timeframe represented by the test is approximately one year, due to the different growth pattern in hair below the neck. Yes, body hair can be used to test for any drug exposure, though body hair growth patterns are different than head hair. Most body hair is replaced within approximately one year. This means a test done with body hair will be reported as drug usage during approximately a one-year timeframe. How does the cut-off levels established? The cut-off levels generally accepted industry-wide. These levels are based in part by minimum detection levels for GC/MS confirmation. Will Liquid Chromatography Mass Spectrometry (LC/MS) or Gas Chromatography Mass Spectrometry (GC/MS) confirmation of all positive hair results? Our laboratory provides confirmation-utilizing LC/MS or GC/MS for all specimens that screen positive. Enzyme-immunoassay antibodies (EIA), similar to those used to test urine, are used for the initial screening test for drugs of abuse in hair; therefore the potential for substances such as over-the-counter medications to cause a false positive screening result does exist. To eliminate the possibility of reporting a false positive due to cross-reactivity, we confirm all positive results by LC/MS or GC/MS. To rule out the possibility of external contamination, we (where appropriate) test for both parent & metabolite (bi-product) of drug usage. For marijuana analyses, we detect only the metabolite (THC-COOH). This metabolite is only produced by the body and cannot be an environmental contaminant.